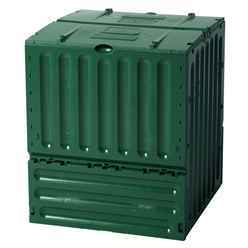 Plastic Composters to buy From iLikeSheds.com at the cheapest prices! The sheds within our Plastic Shed range are constructed from weather resistant plastic in order to keep your garden equipment dry, safe and secure. With no treatment necessary, unlike with wooden storage and wooden sheds, our plastic storage boxes are low maintenance, and require no building or DIY skills. Each plastic storage box has a sloped roof design to drain away rainwater and they can be padlocked to ensure the safety of your garden valuables. The PVC plastic sheds from our Madrid range are a quality building manufactured using a strong steel tube of channel framing which is then clad in quality high grade vinyl. All steel is galvanised and pre-painted to prevent corrosion, and the wall cladding is styled in a “ship lap” finish. Simple to assemble and sturdy for continued use. The doors are pre-assembled at the factory and easily hook onto the hinge pins ready mounted onto the sheds. All plastic sheds and PVC storage sheds must be erected on a firm, level (preferably concrete) base and unless stated they do not come with floor panels as standard. With our Madrid range we do offer a timber base or foundation kit as an optional extra. All plastic sheds will need to be secured to the floor using an anchor kit to stop them from blowing away. We strongly recommend a concrete base but you can use paving slabs if desired but you then need to take into account that the slabs may split when drilling the holes for the anchor kit through them.